5g network - big improvement in mobile connectivity? 2 Comments on 5g – ever given it any thought? I write a regular column for the Institute of Telecoms Professionals Journal, a worthy tome that should be read by engineers everywhere. Usually they chuck a subject over and I hastily scribble something down just before the deadline. Normally the subject matter is something that I’ve come across or been involved with in my working life. This time it’s 5g which is something I’ve never had the occasion to look at. It’s always been something way into the future. Either you are deeply embedded in what’s going with the 5g standard or an article on 5g demands a little research. I went to Wikipedia and I’m going to start by plagiarising a paragraph which in turn whipped it’s content from the NGMN Alliance. Data rates of several tens of Mb/s should be supported for tens of thousands of users. 1 Gb/s to be offered, simultaneously to tens of workers on the same office floor. Up to Several 100,000’s simultaneous connections to be supported for massive sensor deployments. Spectral efficiency should be significantly enhanced compared to 4g. 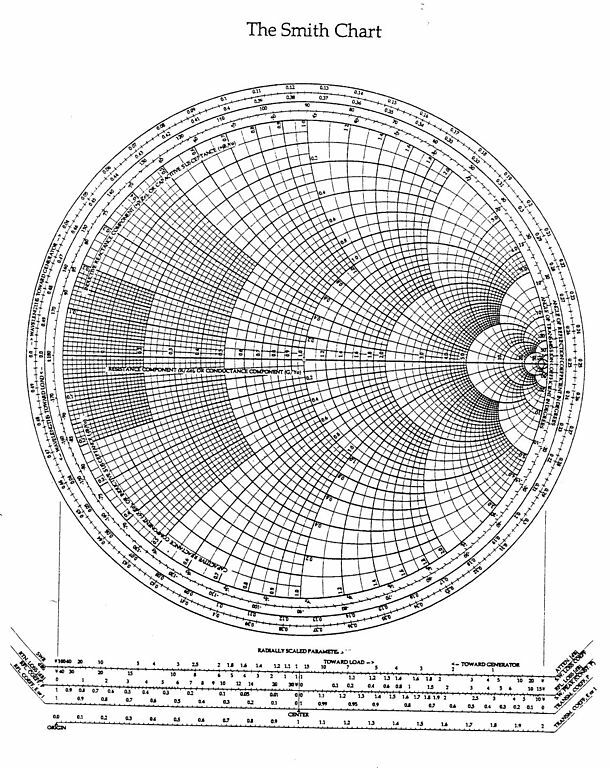 When I were a lad studying Electronic Engineering at Bangor University we learnt about Smith Charts. I never got on with Smith Charts. That and the fact that our Communications lecturer had written a book that he used as the basis for his course content meaning that I didn’t have to take any notes and therefore never remembered any of it suggested that I wasn’t destined for a career in RF engineering. It didn’t matter. There was a whole technological world outside RF that profitably filled my days. In the heady period of early post graduation employment, RF stood largely for an analogue brick that you lugged around in a briefcase or glued to a car battery and whilst important and revolutionary I regarded as a black art of limited interest. Winding the clock forward, gulp, 35 years RF engineering has suddenly taken on a different importance. RF now sits very much as an integral part of our modern technology ecosystem. My own use case for RF is probably identical to everyone else’s. Bluetooth in the car to hook my phone up with the car kit. WiFi gets used wherever there is a hot spot in preference to cellular connectivity. This is largely for economic reasons although WiFi performance where I spend most of my time – home and office – does come into it. This isn’t true everywhere. Then I use 4g. Sometimes I use my mobile phone to talk or send a text but most of the time my use of 4g is for the data channel when I’m out and about. 4g has been a huge step up from 3G but still has its limitations. In building performance is not as good as it might be and coverage can be somewhat binary, at least at this still relatively early stage of network maturity. Except for my home and office my preference is to use 4g wherever possible for my internet connectivity. If there is 4g coverage it is far more reliable and performs better than alternative WiFi networks that may be available to me in hotels, pubs and so on. When there is good 4g coverage it is great. The problem we as users of mobile connectivity have is that we are going to want more and more of it. We aren’t particularly going to want it to work faster on our mobile phones although technology drivers such as 8K video streaming might suggest that our laptops would prefer faster access. We are however going to want it to work reliably and consistently and on more devices. Our personal technology roadmaps see us having many devices that require connectivity. Forget the fridge. It’s our central heating systems, our CCTV, our electricity meters, cars. Also my wallet and keys. I’m forever putting them down somewhere and then forgetting where. It’s the Internet of Things, innit? So the problem that the 5g network needs to address is, yes a certain demand for faster and faster connectivity but also better and more ubiquitous connectivity. Lots more endpoints are going to be connected to the 5g network. PS I’ve written loads on 4g over the years. Check it out here. 4G brought us (I think) a purely packet switching based system, whereas 3G had circuit switched voice. Is there a “generational” jump from 4G to 5G or is it that “generation of network refers to the deployment of a new non-backward-compatible technology” ? It was the promise that the data rate would not drop off as rapidly as 3G the further from the cell tower one was. In fact, IIRC, initial research indicated 4G should be able to sustain 2Mbps speeds at the cell boundary, with cell coverage comparable to 2G. So the theory was that, if operators switched enough carriers over to 4G we would suddenly see massive improvements in usable data coverage, particularly at the “rural fringe”. 5G risks muddying the water, since LTE was meant to be a progressive technology, “evolving” (E-evolution) and keeping networks working for quite a long time. But so far they have focussed on urban areas (not enough backhaul to the cell towers in the country!) and rolled out 2.1GHz 4G that does still suffer from drop-off. I used to know enough about such things to just about keep up with the debate, but alas the pace of change has overtaken me!